I’m holding a 16 foot telescoping polesaw in my left hand while snapping the picture with my right hand. 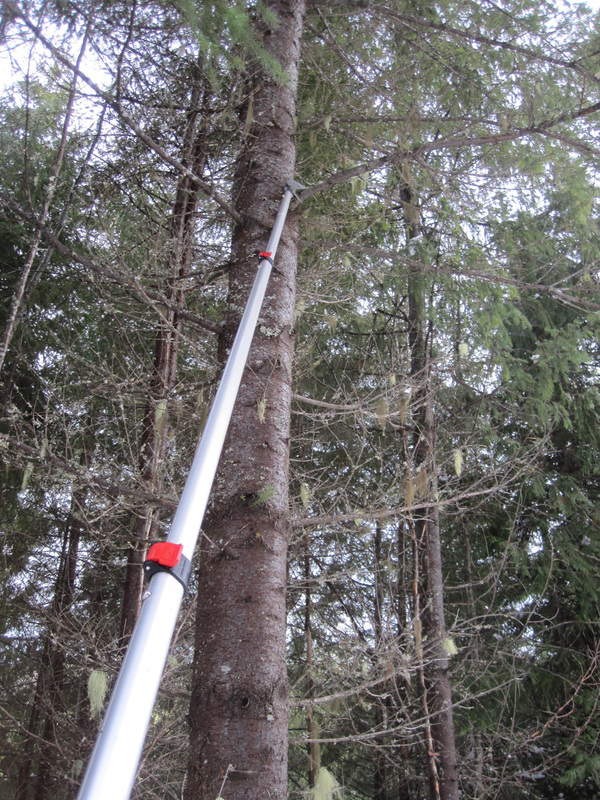 The polesaw is THE tool of choice for limbing trees adjacent to a ski trail. Limbs trap snow and keep it from falling to the ground. To ski, you want snow on the ground. You want a fairly flat and open surface to slide on, without icy patches and pockets, or holes and tree wells. Therefore, the overhead limbs are trimmed back. 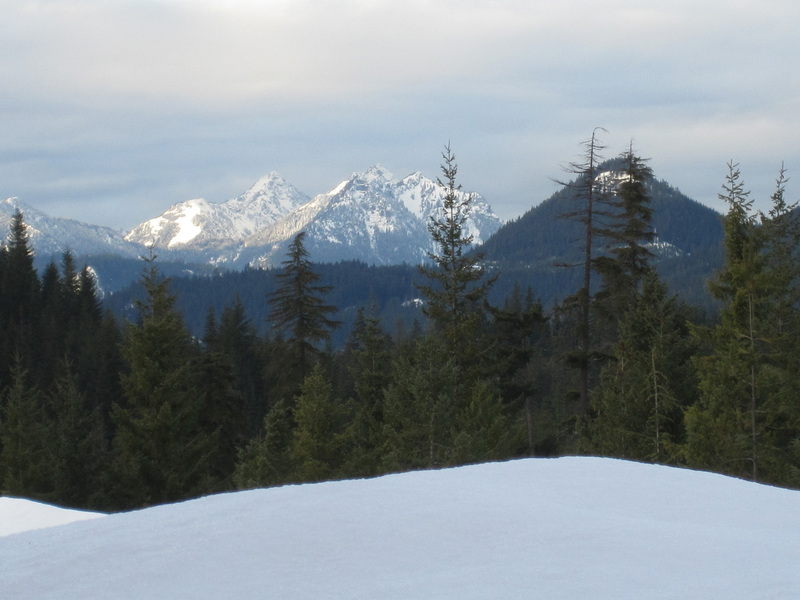 Our snowpack is currently dwindling–there was a little fresh snow yesterday morning, but not a significant accumulation. We could have done the work in our boots, but wore snowshoes. It’s possible for a foot to punch through the snow and throw a person off balance. The claws on snowshoes give some extra traction and flotation while maneuvering around trees with the long saw. It takes some practice to saw while standing on bare ground. You’re looking up, not down at your feet. You need to be prepared for when the branch breaks and falls. You need to move the pole around to get the saw blade at the proper angle to cut. You find yourself stepping backwards. To do this work on snowshoes means figuring out how to walk backwards with big things on your feet. I’m wearing MSR Denalis because the bindings are so easy to get in and out of, and the claws are designed for our Cascade crud snow. The bindings are articulated, so I’ve perfected a little flip to pick the shoe up as I step back. It all comes back to me–I’ve done this before and my feet remember what to do. And that’s good, because my eyes are occupied elsewhere. Just another one of those obscure skills that comes with experience, but is not applicable in any other line of work. Other things about this work that I remember–the smell of conifer sap from fresh cut limbs. My gloves soaking wet from handling the saw that has been set down in the snow and picked up again and again. The crick in my neck from craning it up. Clods of ice that come crashing down as the air temperature warms up. Snowshoe hare tracks. No snow on the horizon. Interesting post for me… things I know; the smell of pitch, snowshoeing, wet gloves, that overhead work would kill my cervical spine; things I don’t know; tripping the Light Fantastic on snowshoes, dodging falling, potentially injurious things, MSR Denali design snowshoes; so I googled em. Learned something this day and it’s still early, yet. My snowshoeing is only straight forward & I’m pretty good at it.. on my pair of wood and hide Pickerals; lightweight, long tailed, narrow.